It’s not a secret that I’m super-duper excited about the launch of Yanakoto Sotto Mute. Grunge idols from the people who brought us Bellring Girls Heart! That’s pretty much guaranteed to be right up Maniac’s alley. And their first EP, 8CM EP, proved that this was a project way the hell on the right track; hard alt-rock with well-matched vocals and members who put on as elegant and artistic a stage show as you’ll see in idol. Their big sisters are going on hiatus, and Yanamyu are being featured in the farewell tour. With the opportunity to share a big stage in front of a big audience, can they take a big step up after just a few months of existence and become a player in the alt-idolverse? Can their second EP (available for free until the 26th!) follow up on the promise shown in the first and equip the group for what’s to come? Guess you’ll have to read the whole thing. I was in no way surprised to hear that Yanamyu stayed true to type on this release. Well, as true to type as five previously released songs from 8CM EP can indicate. 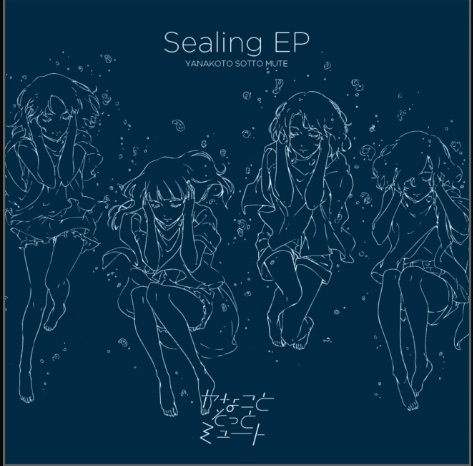 But there’s so much intelligence and maturity and intention behind Yanakoto Sotto Mute’s music that it almost seems unfair; there are a lot of interesting idol rock and idorock acts out there, but they tend toward formulaic, and what’s on Sealing EP is just playing a completely different game at a completely different level. Things kick off with “Awesome” (ツキノメ), which is pretty aptly named — if you recall bands like Toad the Wet Sprocket or pre-ripoff Live, you’ll hear a lot of familiar moves in here. It’s simultaneously murky and promising, and a great start. “Lily,” which you may have heard before, follows it up and is, for my money, the best song on the record, in a lot of ways a parents-approved pop rock song and in a lot of others reminiscent of Binaural-era Pearl Jam played anachronistically by a band like Veruca Salt. Be careful with the choruses on these, as you could easily find yourself stuck in a rapt sing-along. “Horoscope,” which got covered the other day as the official video release for the EP, is the big, bright we-want-you-to-play-this-on-rock-radio song, reminding me of Sparta (a lot of idol alt-rock reminds me of Sparta, for some reason) or, in parts of the instrumentation, BiSH’s “Saraba Kana.” It certainly has an epic edge, and it’s a crowd pleaser, but I think it loses its magic toward the end before it sort of abruptly runs out of steam. The other song on here is the also-familiar “Just Breathe,” and I’m honestly torn on it, and I expect that a lot of people will be, as it employs many elements as it tells a pretty substantial musical story. Don’t get me wrong: There’s nothing at all wrong with the song, and ambition is to be applauded in a world where musical flights to safety are often the norm, except that it ends and I realize that I have no idea what happened because so much was just thrown at me. Overall, given where they are right now, is this the second effort that Yanakoto Sotto Mute needs? I’d say so. If you like them, if you like/d grunge, if idols doing mature, intelligent alt-rock are your thing, etc., you’re going to enjoy this record. I wish they’d make an MV for at least one more song on here, as I want to be constantly reminded just how much beauty and power can exist together in the world.